KLDE/KL-DE/KL03 Vacuum Hose Diagrams for Mazda 626, Mx6, and ford Probe. Diagram taken from Bradbury website. This was a photo of someone elses 626. It seems you can turn the valves, how do you know where they should be turned to? One got turned a bit when I installed my CAI, probably soemthing less than 180 degrees, would this make any difference? 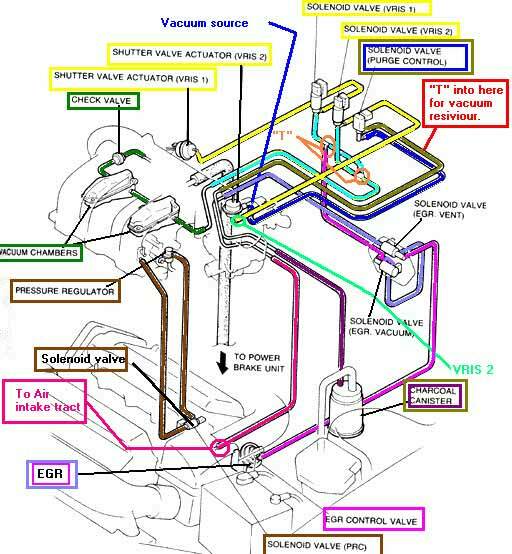 what does the EGR control posion senor do and what position is it sopost to be in? This is great help to find the EGR. The 626 is my wifies car I have multiple BGs so they are just a bit different. OBD III on the 98, my BGs are OBD II. This care is a great cruising vehicle, throws codes often but never has been a seriously ill vehicle. It's always an o2 sensor, air issue. I'm going to pull the Egr to clean, see if that does the trick. I once had a 351M in a 78 Tbird, that was forever stopping up. I have been chasing a P0443 error (EVAP System) for a while. Finally gave up and went to have it tested at TUNEX. They were very helpful and were able to figure out my problem and fix it in an hour. The short story answer is that the electrical connector to the Purge valve was swapped with another connector under the air box. What I did find in my attempts was that the engine changed in 1998-2002. The vacuum diagram posted here is for earlier models. I have attached the printout given to me by TUNEX. I hope it helps. I had a mechanic solve this one for me. It is probably a vacuum leak from the throttle body. The factory gasket wasn't sealing well enough even though it was new. He made a custom gasket out of thicker material that has worked like a champ for over a year. I have a leak somewhere after doing a valve cover gasket and have removed the manifold 5 times, just 3 yesterday and still could not find the air leak. it is coming from the throttle body area but since i bought a new felt pro gasket, i thought it should not be the problem and blamed the canisters which i check is in good condition. do you happen to know if he used some paper/metal gasket or just rtv? There's all sorts of gasket material. For gaskets I prefer Advanced Auto's variety. AutoZone doesn't carry the same stuff. I made my MAF adapter gasket out of a sheet of cork. There's also thin rubber which is good stuff too. You could make a home made one of out a sheet of rubber. Don't know where you'd get that but I've since come to appreciate the rubber gaskets much more than cork. Cork will wear down and eventually get sucked into your intake system. Not good. The rubber and RTV sealant works much better than cork. Cork is for oil gaskets because it soaks it up. It's not for intake gaskets in my opinion but you could use it for that which I have and regret. this is the throttle body gasket i bought and its made out of metal. I was wondering if I should just rtv from the throttle body side with this shape without the metal gasket or should i use the metal gasket and put rtv on both sides? If it's a metal gasket then you shouldn't need to RTV. Metal gaskets should last a lifetime. What kind of gasket was there? I'm honestly not sure about a metal gasket and RTV. You don't want the RTV squishing out so that eventually it will be sucked into the intake. RTV is high temp stuff and it won't break down. Might cause all sorts of trouble so I'd just stick with the metal gasket since it's close to the intake manifold. thanks. just read how bad it is to the head if the rtv get sucked in. My issue now is I believe this metal gasket is not sealing very well. It originally had metal gasket but broke off when i pulled the throttle body. Curious - is this for your 2001 626? The pics of throttle body gaskets on the web look a bit different - this is what I found for 2001 throttle body gasket. Also - found some interesting info here. You may have the incorrect gasket.. "may have".. I will post this somewhere else. I believe on the MX-6 V6 there is is a seal embedded in the throttle body that CANNOT be replaced with a gasket in the same way the I4's can. I don't know if it's the same for the 626 V6 but worth a read anyway. Hope that helps. 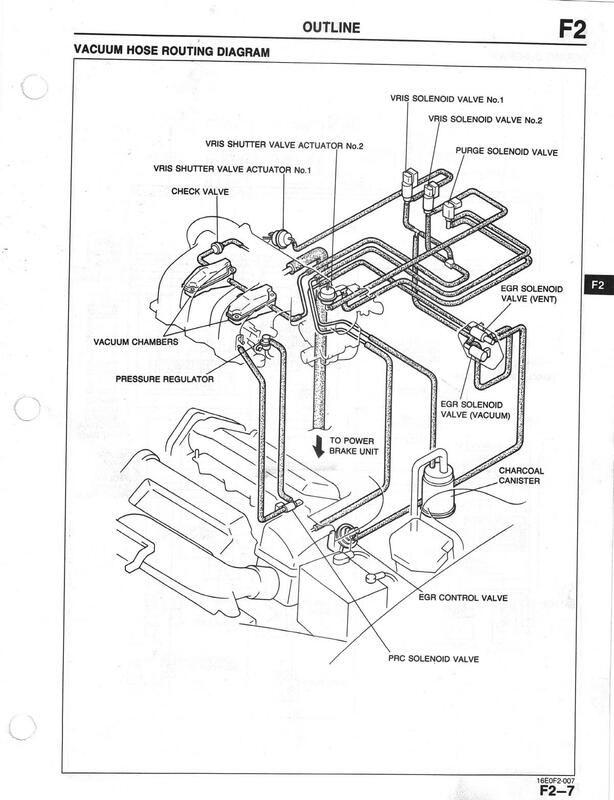 This diagram is missing an egr boost sensor (MAP). Its connected to the egr boost sensor solenoid valve (not shown either). I don't see it in the haynes manual maybe because its not used in a ford probe, but I know it's in mines. This color coded diagram is about to save my life tomorrow. My VRIS isn't functioning properly (no doubt due to the rat's nest of brittle vacuum lines that are supposed to regulate VRIS, and not the 2 new solenoids I just bought (which were tested by directly applying 12 volts)).